Munich - Two of the Bundesliga's newest faces were in dazzling form at the weekend, but it was a relative old hand who got the bundesliga.com users' vote for the best player of Matchday 5. Borussia Dortmund's stormed the post-matchday ballot, his self-professed return to form garnering the Germany international 49 per cent of the final poll. 24-year-old Reus netted his second goal of the campaign as BVB thrashed Hamburger SV on Saturday evening in an awe-inspiring display of attacking football at its very best. "I've got my rhythm and confidence back," he said after the game. "All I care about is football, I love it, and I love this team." 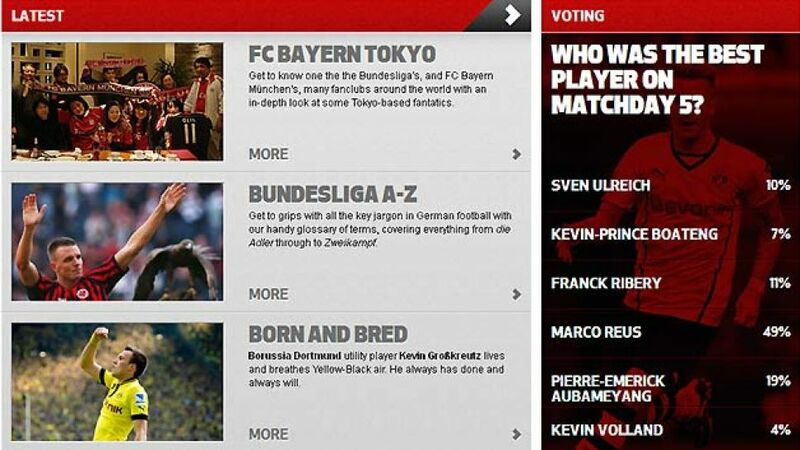 Judging by our poll, so do the bundesliga.com readers. Indeed, you voted another Yellow-Black star onto the podium in second place: Pierre-Emerick Aubameyang (19 per cent). HSV simply had no answer to the Gabon flier's electric pace - one of his many captivating attributes to have taken the Bundesliga by storm. Yet it was his two goals and assist that grabbed the headlines on Sunday morning, with 'Spiderman' taking his goal-scoring tally up to five following a clinical personal display. The 24-year-old now sits joint-top of the scorers' chart after five outings. Also muscling his way into the top four is VfB Stuttgart goalkeeper Sven Ulreich (ten per cent). The Swabians' one-man band pulled off some heroic stops in Friday's opener at Hertha Berlin to ensure Thomas Schneider's men returned home with all three points for the second time in as many outings. FC Schalke 04 followed suit on Saturday afternoon with a 1-0 win of their own at 1. FSV Mainz 05, courtesy of Kevin-Prince Boateng's first goal for the club, but that firecracker was only deemed good enough for a fifth-place finish once the votes had been counted and verified, with FC Bayern München's Franck Ribery (eleven per cent) receiving four per cent more than the Ghanaian international and outgunning 1899 Hoffenheim sensation Kevin Volland (four per cent) as well.